His name comes from the Greek word, tygchanō, which means, “to hit the mark” or “to meet one”. The word sin comes from the Greek, hamartanō, which means “to miss the mark”. When we sin we are missing the mark of Christ’s righteous standard, his law. In Christ, God sees us as having “hit the mark” because Christ’s righteousness is our righteousness. Paul describes Tychicus as a “beloved brother and faithful minister and fellow servant of the Lord.” The word for minister in Greek is diakonos. This word desribes “one who executes the commands of another, esp. of a master, a servant, attendant, minister”. This word often times was used to describe the servant of a king. For Paul and Tychicus, this servitude was under the kingship of Jesus Christ. With this understanding of minister Tychicus was executing the commands of King Jesus as he delivered Paul’s letter to the church in Colossae. Ephesians 6:21 -Tychicus was also the one who delivered Paul’s letter to Ephesus. Acts 20:4 lets us us know that Tychicus was from Asia. Onesimus accompanied Tychichus to Colossae. He is called a “beloved brother” but he is not called a co-worker in Christ as Tychichus is because at the time Onesimus is a slave! Philemon 8-11 – We learn that Onesimus is a slave from Paul’s letter to Philemon. Philemon is a letter Paul wrote on behalf of Onesimus to his master, Philemon. From this letter we learn that Onesimus was a runaway slave of Philemon, a believer. After running away from Philemon, Onesimus becomes a Christian himself. Onesimus means “useless” and Paul writes to Philemon saying that formerly he was literally useless! Maybe he was useless because he ran away, or maybe he was a very poor slave. Now Paul says that Onesimus is useful. Paul calls Aristarchus his “fellow prisoner”. The etymology of the word for prisoner that is used in this verse comes from the Greek word, aichme, which means “spear”. This indicates that Paul is viewing Aristarchus and himself as “prisoners of war”. They are ones that have been taken! Not just imprisoned. Going back to the minister understanding mentioned with Tychicus, Paul and Aristarchus are servants charged with executing the commands of their king, Jesus Christ! To capture a king’s ministers is an act of war. This really is Paul’s mentality throughout his ministry. The war language and theme run throughout his works. I think it will serve us a great interest to approach everyday life in God’s Kingdom as being at war. We are not at ease in this life. Recognizing the constant state of war we find ourselves, we will be spurred on to follow Paul’s plea to put on the full armor of God as Paul commands us in Ephesians 6. 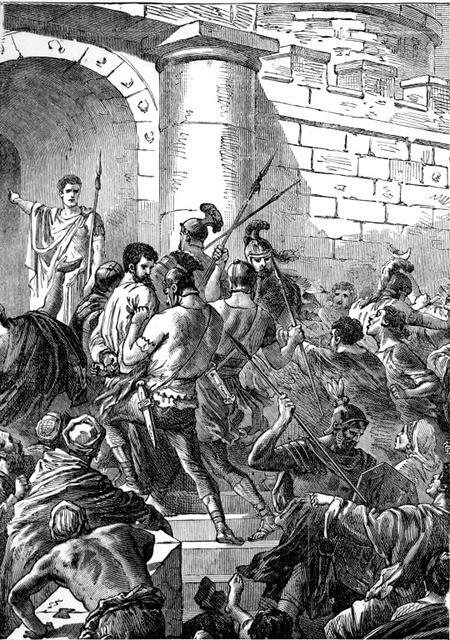 Acts 19:29 – Aristarchus was present at the riot at Ephesus and was dragged away by the mob. Read the full account in Acts 19:21-41. Aristarchus grabbed in the riot at Ephesus – Acts 19. This verse is the only time that Justus is mentioned in the Bible. We see from this verse that he was Jewish, as well as Aristarchus. He’s mentioned in Colossians 1:7. Since Paul says the church in Colossae learned the Gospel from Epaphras, he is most likely the church’s founder. He is called one of them, so he is Colossian. Paul says that Epaphras is always struggling on in his prayers on behalf of the Colossians. This language still harkens to that of war. His prayers are a struggle. From such descriptions we can draw the often time used description, “Prayer Warrior”. We read that Luke is a physician. This Luke is the author of the Gospel of Luke. Demas sends his greetings along with Luke, but in 2 Timothy 4:10, we learn that Demas deserted Paul. Maybe he left the Christian faith, or maybe he just was afraid of sticking with Paul, afraid of imprisonment and death. He is mentioned in Philemon vs. 2. There he is called a “fellow soldier” (again war language) and we learn that a church congregation met in his house. From this study of the names at the end of Colossians, we can be encouraged to know that God has blessed and equipped the Body of Christ with a wide assortment of gifts, roles, and personalities. We span different nations and language, yet we are united in Christ. Some of us will own property that is useful for the church, as we will be generous enough to offer it. Some of us will be in vocations like Luke, a physician, whose skills will be very useful within the Church and for our neighbors in the world. Some of us will be like Justus, called to a people not our own. Some of us might appear to be useless like Onesimus, but through Christ, we will be reworked into instruments for the Kingdom of God we will be useful, minsters and supporters to the leaders God has appointed within his Church. Some of us will be prayer warriors. We may not be on the front lines preaching the Gospel, but we might be constant anguish, praying for those who are. Some of us might be prisoners of war, and all of us are co-workers and soldiers for Christ. And thanks be to God, that through the person and work of Jesus Christ, we all are seen to have hit the mark, just like Tychicus’ name implies. And may we be able “to meet others” as that name also implies and join them into Christ through the sharing of the Gospel of our risen King Jesus. Previous Post Where is Jesus in Song of Songs 7:7-9? Next Post Ashes to Ashes and Dust to Dust. From Whence We Came We Shall Return.